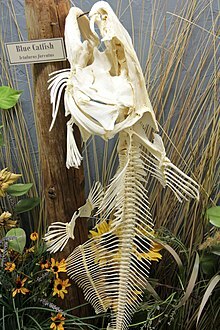 Actinopterygii (/ˌæktɪˌnɒptəˈrɪdʒiaɪ/), or the ray-finned fishes, constitute a class or subclass of the bony fishes. The ray-finned fishes are so called because their fins are webs of skin supported by bony or horny spines ("rays"), as opposed to the fleshy, lobed fins that characterize the class Sarcopterygii (lobe-finned fish). These actinopterygian fin rays attach directly to the proximal or basal skeletal elements, the radials, which represent the link or connection between these fins and the internal skeleton (e.g., pelvic and pectoral girdles). Ray-finned fishes occur in many variant forms. 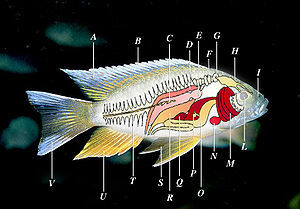 The main features of a typical ray-finned fish are shown in the adjacent diagram. Ray-finned fish are varied in size, shape and the arrangement and number of their ray-fins. See fish fin. In nearly all ray-finned fish, the sexes are separate, and in most species the females spawn eggs that are fertilized externally, typically with the male inseminating the eggs after they are laid. Development then proceeds with a free-swimming larval stage. However other patterns of ontogeny exist, with one of the commonest being sequential hermaphroditism. In most cases this involves protogyny, fish starting life as females and converting to males at some stage, triggered by some internal or external factor. Protandry, where a fish converts from male to female, is much less common than protogyny. Most families use external rather than internal fertilization. Of the oviparous teleosts, most (79%) do not provide parental care. Viviparity, ovoviviparity, or some form of parental care for eggs, whether by the male, the female, or both parents is seen in a significant fraction (21%) of the 422 teleost families; no care is likely the ancestral condition. Viviparity is relatively rare and is found in about 6% of teleost species; male care is far more common than female care. Male territoriality "preadapts" a species for evolving male parental care. 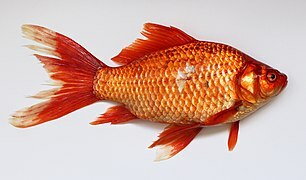 There are a few examples of fish that self-fertilise. The mangrove rivulus is an amphibious, simultaneous hermaphrodite, producing both eggs and spawn and having internal fertilisation. This mode of reproduction may be related to the fish's habit of spending long periods out of water in the mangrove forests it inhabits. Males are occasionally produced at temperatures below 19 °C (66 °F) and can fertilise eggs that are then spawned by the female. This maintains genetic variability in a species that is otherwise highly inbred. The earliest known fossil actinopterygiian is Andreolepis hedei, dating back 420 million years (Late Silurian). Remains have been found in Russia, Sweden, and Estonia. Actinopterygians are divided into the subclasses Chondrostei and Neopterygii. The Neopterygii, in turn, are divided into the infraclasses Holostei and Teleostei. During the Mesozoic and Cenozoic the teleosts in particular diversified widely, and as a result, 96% of all known fish species are teleosts. The cladogram shows the major groups of actinopterygians and their relationship to the terrestrial vertebrates (tetrapods) that evolved from a related group of fish. Approximate dates are from Near et al., 2012. The polypterids (bichirs and ropefish) are the sister lineage of all other actinopterygians, the Acipenseriformes (sturgeons and paddlefishes) are the sister lineage of Neopterygii, and Holostei (bowfin and gars) are the sister lineage of teleosts. The Elopomorpha (eels and tarpons) appears to be the most basic teleosts. Atlantic sturgeon Chondrostei (cartilage bone) are primarily cartilaginous fish showing some ossification. Earlier definition of Chondrostei is now known to be paraphyletic meaning that this subclass does not contain all the descendants of their common ancestor. There were 52 species divided among two orders, the Acipenseriformes (sturgeons and paddlefishes) and the Polypteriformes (reedfishes and bichirs). Reedfish and birchirs are now separated from the Chondrostei into their own sister lineage, the Cladistia. It is thought that the chondrosteans evolved from bony fish but lost the bony hardening of their cartilaginous skeletons, resulting in a lightening of the frame. Elderly chondrosteans show beginnings of ossification of the skeleton, suggesting that this process is delayed rather than lost in these fish. This group had once been classified with the sharks: the similarities are obvious, as not only do the chondrosteans mostly lack bone, but the structure of the jaw is more akin to that of sharks than other bony fish, and both lack scales (excluding the Polypteriforms). Additional shared features include spiracles and, in sturgeons, a heterocercal tail (the vertebrae extend into the larger lobe of the caudal fin). However the fossil record suggests that these fish have more in common with the Teleostei than their external appearance might suggest. Atlantic salmon Neopterygii (new fins) appeared somewhere in the Late Permian, before the time of the dinosaurs. There are only few changes during their evolution from the earlier actinopterygians. 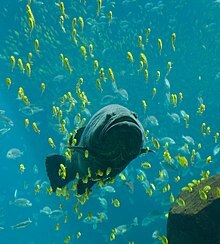 They are a very successful group of fishes, because they can move more rapidly than their ancestors. Their scales and skeletons began to lighten during their evolution, and their jaws became more powerful and efficient. While electroreception and the ampullae of Lorenzini is present in all other groups of fish, with the exception of hagfish, Neopterygii has lost this sense, though it later re-evolved within Gymnotiformes and catfishes, who possess nonhomologous teleost ampullae. The listing below follows Phylogenetic Classification of Bony Fishes with notes when this differs from Nelson, ITIS and FishBase and extinct groups from Van der Laan 2016. Clade Actinopteri Cope 1972 s.s.
Teleocephala de Pinna 1996 s.s.
^ Kardong, Kenneth (2015). Vertebrates: Comparative Anatomy, Function, Evolution. New York: McGraw-Hill Education. pp. 99–100. ISBN 978-0-07-802302-6. ^ Dorit, R.L. ; Walker, W.F. ; Barnes, R.D. (1991). Zoology. Saunders College Publishing. p. 819. ISBN 978-0-03-030504-7. ^ Avise, J.C.; Mank, J.E. (2009). "Evolutionary perspectives on hermaphroditism in fishes". Sexual Development. 3 (2–3): 152–163. doi:10.1159/000223079. PMID 19684459. ^ Pitcher, T (1993). The Behavior of Teleost Fishes. London: Chapman & Hall. ^ a b c Reynolds, John; Nicholas B. Goodwin; Robert P. Freckleton (19 March 2002). "Evolutionary Transitions in Parental Care and Live Bearing in Vertebrates". Philosophical Transactions of the Royal Society B: Biological Sciences. 357 (1419): 269–281. doi:10.1098/rstb.2001.0930. PMC 1692951. PMID 11958696. ^ Clutton-Brock, T. H. (1991). The Evolution of Parental Care. Princeton, NJ: Princeton UP. ^ Werren, John; Mart R. Gross; Richard Shine (1980). "Paternity and the evolution of male parentage". Journal of Theoretical Biology. 82 (4): 619–631. doi:10.1016/0022-5193(80)90182-4. Retrieved 15 September 2013. ^ Baylis, Jeffrey (1981). "The Evolution of Parental Care in Fishes, with reference to Darwin's rule of male sexual selection". Environmental Biology of Fishes. 6 (2): 223–251. doi:10.1007/BF00002788. ^ Wootton, Robert J.; Smith, Carl (2014). Reproductive Biology of Teleost Fishes. Wiley. ISBN 978-1-118-89139-1. ^ a b c Thomas J. Near; et al. (2012). 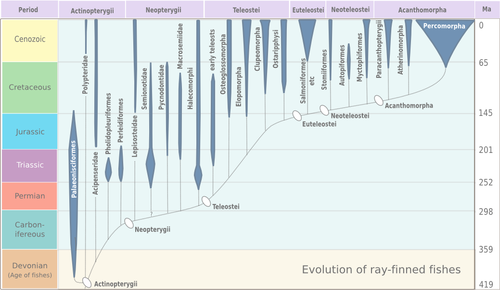 "Resolution of ray-finned fish phylogeny and timing of diversification". PNAS. 109 (34): 13698–13703. Bibcode:2012PNAS..10913698N. doi:10.1073/pnas.1206625109. PMC 3427055. PMID 22869754. ^ a b Betancur-R, Ricardo; et al. (2013). "The Tree of Life and a New Classification of Bony Fishes". PLOS Currents Tree of Life. 5 (Edition 1). doi:10.1371/currents.tol.53ba26640df0ccaee75bb165c8c26288. PMC 3644299. PMID 23653398. Archived from the original on 13 October 2013. ^ a b "Chondrosteans: Sturgeon Relatives". paleos.com. Archived from the original on 25 December 2010. ^ Theodore Holmes Bullock; Carl D. Hopkins; Arthur N. Popper (2005). Electroreception. Springer Science+Business Media, Incorporated. p. 229. ISBN 978-0-387-28275-6. ^ Betancur-Rodriguez; et al. (2017). "Phylogenetic Classification of Bony Fishes Version 4". BMC Evolutionary Biology. 17 (1): 162. doi:10.1186/s12862-017-0958-3. PMC 5501477. PMID 28683774. ^ Nelson, Joseph, S. (2016). Fishes of the World. John Wiley & Sons, Inc. ISBN 978-1-118-34233-6. ^ "Actinopterygii". Integrated Taxonomic Information System. Retrieved 3 April 2006. ^ Van der Laan, Richard (2016). Family-group names of fossil fishes. doi:10.13140/RG.2.1.2130.1361. ^ In Nelson, Polypteriformes is placed in its own subclass Cladistia. ^ In Nelson and ITIS, Syngnathiformes is placed as the suborder Syngnathoidei of the order Gasterosteiformes.